This small principality stretches along a section of the Cantabrian coastline between the rivers Eo and Deva, with its southernmost limits made up by the Cantabrian Mountains. The abundance of rainfall and its geographical location has made Asturias a truly wealthy region in terms of flora, fauna and landscape. It certainly possesses some of the wildest, most scenic countryside in Spain, as typified by the wonderful Picos de Europa, a diverse and mountainous National Park that spreads over the provinces Asturias, Cantabria and Castile & León. But it also includes seaside towns of some elegance, historic cities and fine coastal areas with sheer gorges and cliffs, not to mention its beaches. Its natural attributes make it a favourite location for many trekkers and climbers. Whether you want to relax in one of our sea side boutique hotels in Asturias or in a cozy country inn in the Cantabrian mountains, we are sure you will find something special in our selection. If not, just contact us and we will be more than happy to send you some beautiful places to stay to choose from in Asturias. Lovers of wild nature are sure to enjoy Asturias, replete as it is with some of the most beautiful landscapes and scenery, including the magnificent Picos de Europa. This is trekking, climbing and caving country par excellence. It is also worth noting that Asturias has a strong pre-historic heritage.The region is sprinkled with numerous and worthy prehistoric monuments such as the Tito Bustillo Cave (Ribadesella) or El Idolo de Peña Tú (Llanes). Those interested will enjoy a visit to the Archaeological Museum and Museum of Fine Arts in Oviedo. The local seaside resorts also provide fine beaches. The sea, rivers “huertas” and mountains have endowed the Asturias with a fine gastronomic heritage, the main characteristics of which are its fine, natural ingredients and simplicity of preparation. Well-known and traditional dishes include 'la fabada' (a large bean stew), perhaps the best-known and traditional dish in the Asturias. Unsurprisingly the abundance and quality of seafood manifests itself in some wonderful dishes, such as the “Calderada”, a sort of hot pot of various fish. Fresh water fish, including trout and salmon, are plentiful from spring onwards. One of the regions’ gastronomical delights is its locally produced cheese - over 30 different types made from cow, and goat’s milk. 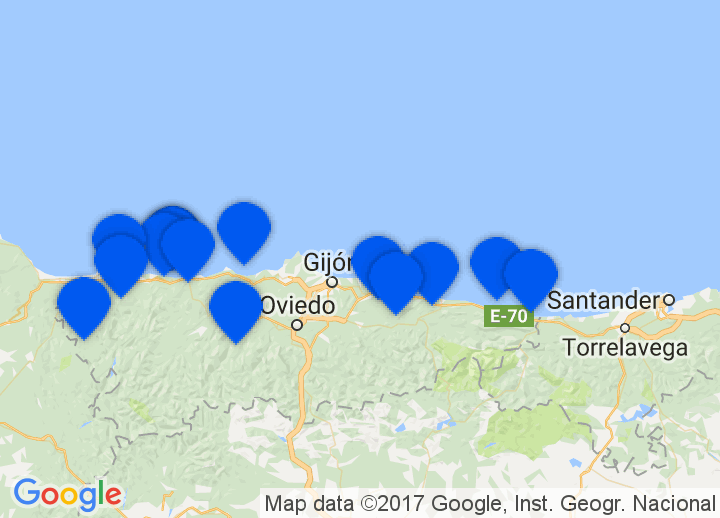 Look out for Cabrales, Gamonedo, and Los Beyos etc. All this fine food can be washed down with some excellent the excellent local cider; undoubtedly some of the finest in Spain, and to be found in plentiful supply throughout the regions many popular festivities.